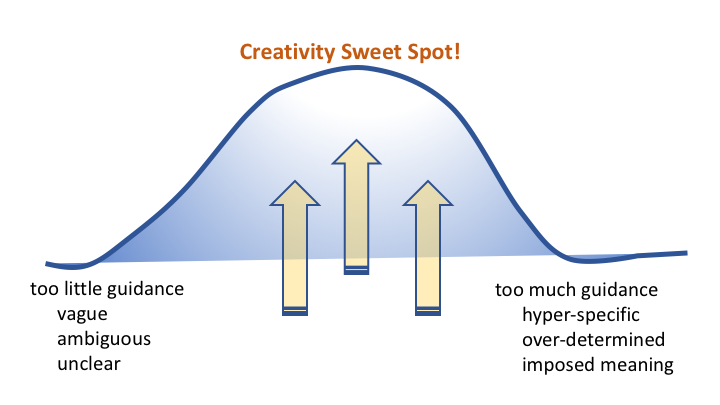 Where is your sweet spot for coming up with good creative ideas? Imagine that you have just been invited to take part in an online experiment in which you will be asked to generate as many creative ideas as possible. Imagine, too, that you are given the opportunity to first read the instructions for the creative challenge you will be set, and that you can choose between one of two sets of instructions, A or B. You are also told that exactly 25% of the responses will be reviewed (Version A) or, instead, that some –– no percentage specified –– will be reviewed (Version B). Additionally, you are told “You will receive your compensation within 48 hours of completing this task, in your PayPal account” (Version A) or “You will receive your compensation within 2 days” (Version B). Which of the two versions of the instructions do you prefer: Version A or Version B? Do you think you’d be likely to come up with more creative ideas if given Version A or if given Version B? Why? « How’s your robot feeling today?